Other than the “man in the tree,” the biggest news of the week in the greater Seattle area was the opening of the Capitol Hill and University of Washington Link Light Rail stations. Seattle Southside was already connected from SeaTac and Tukwila through Westlake Center by the light rail; but it was a bit more difficult to reach Capitol Hill or Husky Stadium from the south. Well, the light rail has changed all that! My fiancée and I wanted to check out the new stations, and we also wanted to see how long it would take us to get to them from SeaTac. 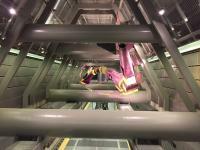 To begin our journey, we walked down to the SeaTac light rail station from the Seattle Southside Visitor Center. We took the elevator up and bought our tickets at the kiosk. Prices vary by intended destination, and of course we were going as far as we could possibly go, so our roundtrip day pass ended up costing $6.50 each. We boarded the light rail at 11:13am and we started moving at 11:15am. The trip started out with some nice views of the area! We were well above the traffic below, a little too high to see the envy on the car commuters faces, but it’s a fair bet that they were green with jealous rage. 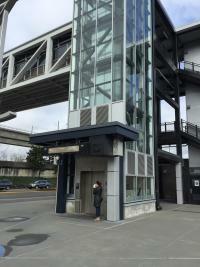 The first stop was at Tukwila International Boulevard station. The significance of this stop is that there is a huge parking lot for commuters looking to take the light rail to Seattle instead of I-5. This comes in handy if you’re like most commuters from South King County and not within walking distance to a light rail station. We walked down the street and stopped at Pinto Thai Bistro & Sushi Bar. I’m not exaggerating when I say this: this place had the best Pad Thai I’ve ever had. And it only cost $8.50 for lunch! But that’s not what this blog is about. We’re talking about the light rail here! We checked out a few shops after lunch and headed back down to the depths of the Capitol Hill light rail station. The trip from Capitol Hill to UW only took four minutes…FOUR MINUTES! That’s really amazing when you think about how long it takes to drive the distance, especially with Seattle traffic. The UW station looked even more futuristic than the Capitol Hill station and our escalator journey included some striking illuminated blue pictograms and designs on the walls. 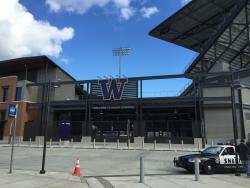 When we made it to the surface, we were delighted to find ourselves right at the entrance of Husky Stadium. Finally, I’ll be able to see some Husky games right after work without having to fight the oftentimes brutal Seattle traffic. I can imagine the bustling stations on gameday, especially if the Huskies have a good season next year (we’ll see). If you were wondering, it took exactly forty-four minutes to get from UW back down to SeaTac. We have high hopes for the light rail in Seattle and it seems like the track will continue to expand for the foreseeable future. If you’re going to a Husky/Seahawks/Mariners/Sounders game any time soon, I highly recommend taking the light rail. Trust me, you do not want to test Seattle traffic or parking enforcement; and because of the light rail, you won’t have to.